Written by NewsOrg.Org editor-in-chief Dan Blacharski (yours truly), this book looks at the great disruptions occurring in marketing as more legacy companies move to cloud models, and new born-in-the-cloud companies start with a business model that was unheard of just twenty years ago. Companies born in the cloud, from the dotcoms of the ’90s to the present day, don’t succeed by sticking to legacy sales and marketing models. Not only are these companies offering an entirely new way of creating and delivering products, they must also create an entirely new way of selling them. In this book, I open with a look at some of the too-common myths that have come to dominate the dotcloud world, and where Internet marketers are still missing the mark today. With quotes and interviews with several Internet entrepreneurs, the book covers doing business in the post dot-com era, where business is done at lightning speed, consumers are better informed than ever, and where “content is king” is only the beginning of a very long journey. We’re seeing a very narrow window of opportunity, not seen since the last dotcom boom, where startup entrepreneurs with limited resources can still make it big – if they approach marketing the right way. And it’s easy to get lost amidst the hype of $99 SEO specials, spammy tactics and rogue operators who claim to know the great secrets to the inner workings of Google. In fact, as noted in the book, the sort of fakery that has become so commonplace seldom results in any lasting success. Content really is king, but it is only king so long as the content is real. The all-too-common practice of blanketing the Web with poorly-written, keyword-rich spam is an attempt to take the easy way out. As noted in the chapter on Brand Journalism though, sustained growth is achieved only when that content takes the form of true thought leadership, written to adhere to the highest journalistic standards. In “The Big Lie of SEO” chapter, I cover some of these issues, and specify exactly where the SEO marketers are going wrong – and discuss how SEO has become, of necessity, an extension of public relations rather than an isolated practice. SEO, offered by individual SEO practitioners who do not understand public relations, will accomplish little, and may even harm your brand. 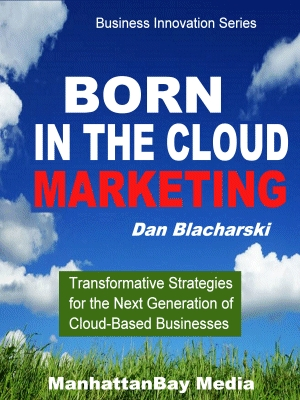 The book, “Born in the Cloud Marketing,” is available on Amazon.